These elegant Honor Flag Cases proudly display a cherished possession. They come in two sizes 16" X 8" X 3" or 25" X 12 1/2" X 3 3/4" and are in a beautiful rosewood finish. You can add a plate to the bottom for any personalization needs that you might require. 16" X 8" X 3"
25" X 12 1/2" X 3 3/4"
Elegant certificate holder award in unique jade acrylic. No one will be left with any doubt as to who the winner of the tournament with this incredible four post male karate trophy. The karate figure at the top of the award is shown in a front kick position. Other highlights of this award trophy is the unique design pattern and color of the columns, additionally, the eagle Mylar holder in the center has 3rd Place Mylar, but you can change that out for any other Mylar that might fit your needs. The wood three post base is in a triangle shape and has plenty of room for any of your recognition and personalization needs. This award trophy measures 26" tall. After you have added this item to your cart, you can modify any of the parts for any sporting or academic activity. Your recipient wont believe their eyes when they see this award trophy! No one will be left with any doubt as to who the winner of the tournament with this incredible four post male karate trophy. The karate figure at the top of the award is shown in a front kick position. 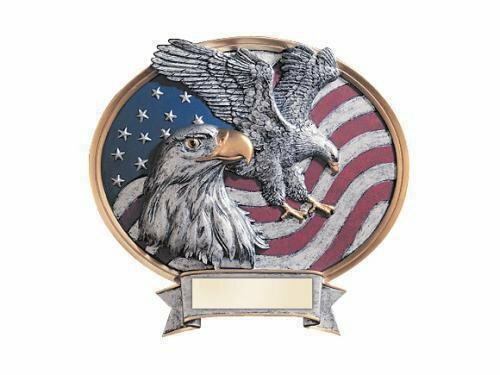 Other highlights of this award trophy is the unique design pattern and color of the columns, additionally, the eagle Mylar holder in the center has 2nd Place Mylar, but you can change that out for any other Mylar that might fit your needs. 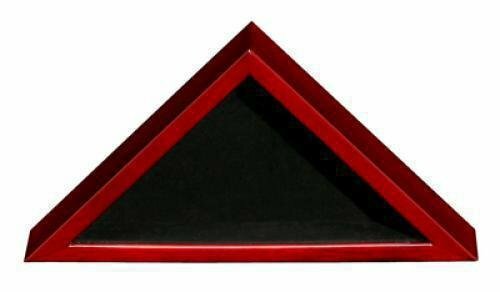 The wood three post base is in a triangle shape and has plenty of room for any of your recognition and personalization needs. This award trophy measures 29" tall. After you have added this item to your cart, you can modify any of the parts for any sporting or academic activity. Your recipient wont believe their eyes when they see this award trophy! No one will be left with any doubt as to who the winner of the tournament with this incredible four post male karate trophy. The karate figure at the top of the award is shown in a front kick position. Other highlights of this award trophy is the unique design pattern and color of the columns, additionally, the eagle Mylar holder in the center has 1st Place Mylar, but you can change that out for any other Mylar that might fit your needs. The wood four post base has plenty of room for any of your recognition and personalization needs. This award trophy measures 36" tall. After you have added this item to your cart, you can modify any of the parts for any sporting or academic activity. Your recipient wont believe their eyes when they see this award trophy! You have lots of choices with these Legend Air Force Awards. The icons in the award are raised providing a 3-dimensional look. A fighter pilot in full gear is depicted while a jet is shown in flight to complete the scene. 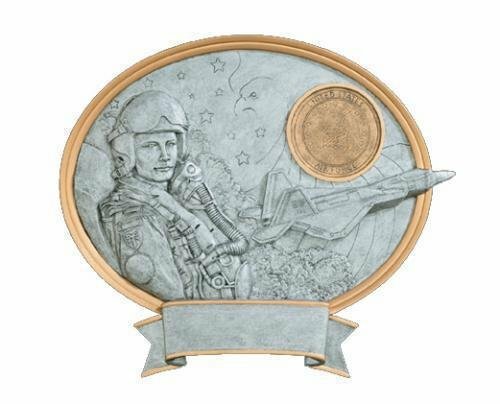 Additionally, you can also choose a 2" Mylar to highlight a specific achievement or that space can be left alone to show the Air Force insignia. These oval awards are available in male or female version and measure 8 1/2" X 8". A large area at the bottom of the award can accommodate your personalization needs while the gold and pewter finish complement the look of the award. This item can either be hung on a wall or placed on a desk using the included stand. You have lots of choices with these Legend Army Awards. The icons in the award are raised providing a 3-dimensional look. A soldier in full gear is depicted while a tank for the male version and a helicopter for the female version are featured to complete the scene. 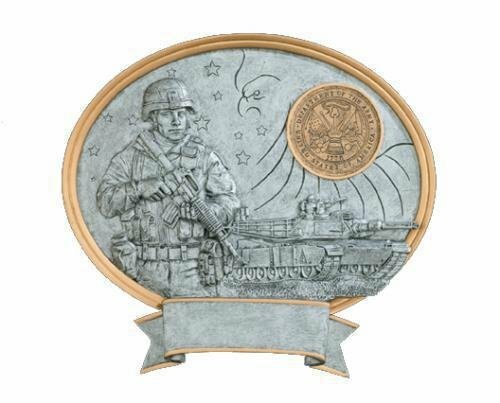 Additionally, you can also choose a 2" Mylar to highlight a specific achievement or that space can be left alone to show the Army insignia. These oval awards are available in male or female version and measure 8 1/2" X 8". A large area at the bottom of the award can accommodate your personalization needs while the gold and pewter finish complement the look of the award. This item can either be hung on a wall or placed on a desk using the included stand.